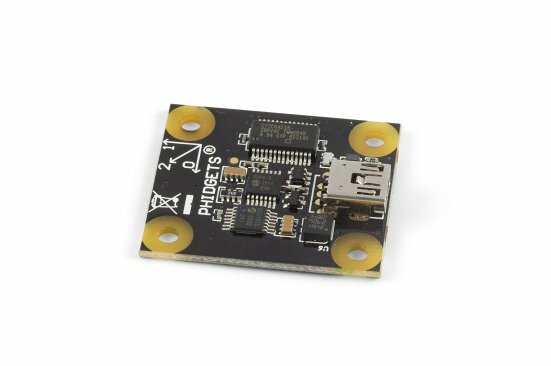 This spatial board had a 3-axis, ±5g accelerometer and connects to your computer via USB. Replaced by the 1043 - PhidgetSpatial 0/0/3 High Resolution. The 1049 - PhidgetSpatial 0/0/3 measures static and dynamic acceleration in 3 axes, up to 5g, and provides a high sampling speed of up to 1000 samples per second. Each accelerometer axis is calibrated at the factory for cross-axis misalignment, sensitivity to positive and negative acceleration, and offset. Sense tilt in remotely operated vehicles. Capture motion input for gaming or for Human Interface Research. Capture long term vibration data to help with the analysis of machinery performance. Detect movement or presence by measuring structural vibration. The 1056 PhidgetSpatial 3/3/3 provides 16 times better resolution on the acceleration data, but is limited to 250 samples per second. You can protect your board by purchasing the 3811 - Acrylic Enclosure for the 1049. April 2012 Product Discontinued. Succeeded by the 1041 - PhidgetSpatial 0/0/3 Basic or the 1043 - PhidgetSpatial Precision 0/0/3. Now that you have everything together, let's start using the 1049! In order to demonstrate the functionality of the 1049, the Phidget Control Panel running on a Windows machine will be used. Linux users can follow the getting started with Linux guide and continue reading here for more information about the 1049. 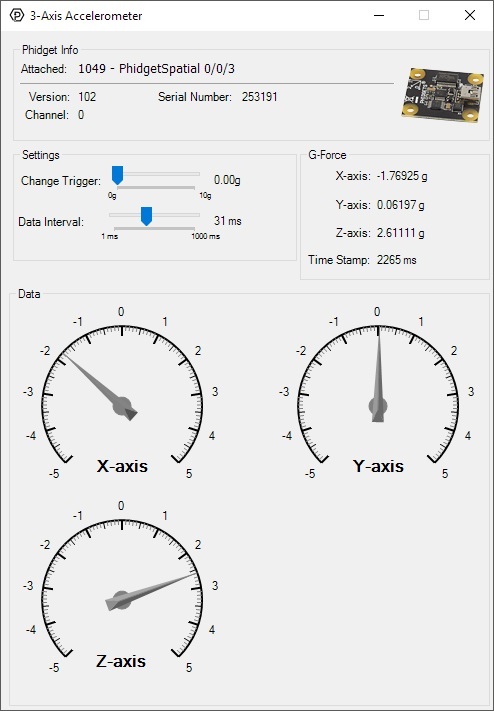 Modify the change trigger and/or data interval value by dragging the sliders. For more information on these settings, see the data interval/change trigger page. Try tilting the 1049 in different directions to see the labels and graphics change.